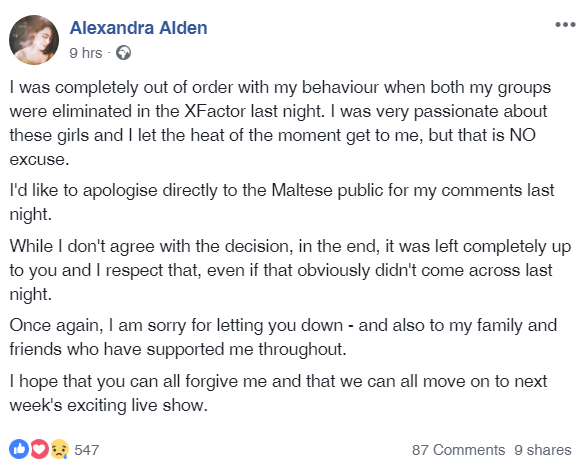 Alexandra Alden, a member of the X Factor Malta judging panel, has apologised after passing a comment yesterday which, according to many, was not right. Alden has apologised to the public after addressing them and telling them ‘shame on you’ at the point when a group of singers she was leading for the X Factor Malta competition were eliminated. Alden stated that she passed her comment in the heat of the moment, as the singers who were eliminated were special persons for her. Alden added that there was no way she should have passed this comment, as in the end, the competition is left completely up to the public to vote for the winner.